In addition to the Berlin U-bahn, which is an underground network, there is also the S-bahn, which in the central areas of the city is elevated above street level, giving splendid views . Well, there is not much time to enjoy the view from Hauptbahnhof to Bellevue, it’s the next stop. 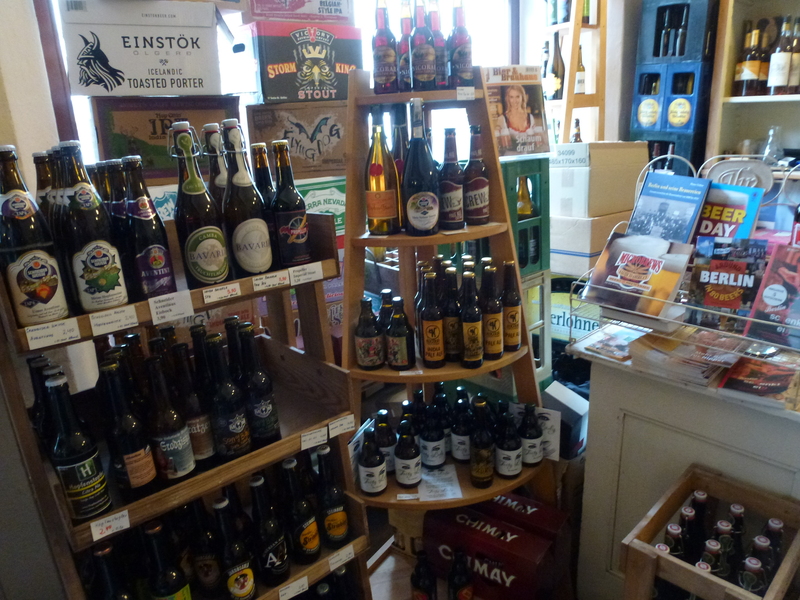 Cross the bridge and walk up a short street, and you find the Berlin Bier Shop. Bier jenseits des Mainstreams is the motto on their web page. Sure, you can stock up on all the bocks, helles, pils etc. you’d want. But the reason to go here is for the more sophisticated stuff. They cater for two types of customers: Germans who want interesting imports and tourists who want interesting German beers. The imports include the big names from Denmark and the US. Mikkeller sells well, the customers have often visited Copenhagen and know the price level. Slightly lower alcohol taxes and VAT equals more or less the cost of distribution, meaning you pay more or less the same for a bottle of Mikkeller as you would in Denmark. Students from the brewing college are eager to get new stuff coming in, particularly on-offs like the new yeast series. For foreign visitors you are able to get some real treats. New beers from Berlin gypsy brewer Schoppe Bräu. Craft beers from the Czech Republic. I had some serious problems making up my mind. My suitcase was already bulging, and I knew I was in for a scolding from the Lufthansa check-in staff. But I could not resist a barrel aged dark Gose. And a Berliner Weisse brewed with smoked malt. How is that for innovation? Friendly and polite service. Once again my apologies for my German. The vocabulary is coming along fine, thank you. But the nuances of grammar and the use of the polite Sie instead of du leaves a lot to be desired. Other visitors don’t need to worry. They even use English on their web pages. This is a must stop on a Berlin beer tour. A serious beer shop. Like Johnny’s Off Licence in Rome or Ølbutikken in Copenhagen. Peter M. Eronson runs the Swedish beer blog Fat & Flaska, and he has published a list of the 100 best sellers in Sweden’s Systembolaget. The ranking reflect sales in Swedish Kronor, but the right column shows the volume in liters. The category includes beer, ciders and alcopops. This shows, that, for all the talk about craft taking over the world, it is all about pale lagers. The only exceptions, Newcastle Brown Ale (64), Falcon Bayersk (65), Brooklyn Lager (74) and Innis & Gunn Oak Aged Beer (88) are not something I’d go out of my way for, either. This also show the contrast between the Swedish and the Norwegian markets. 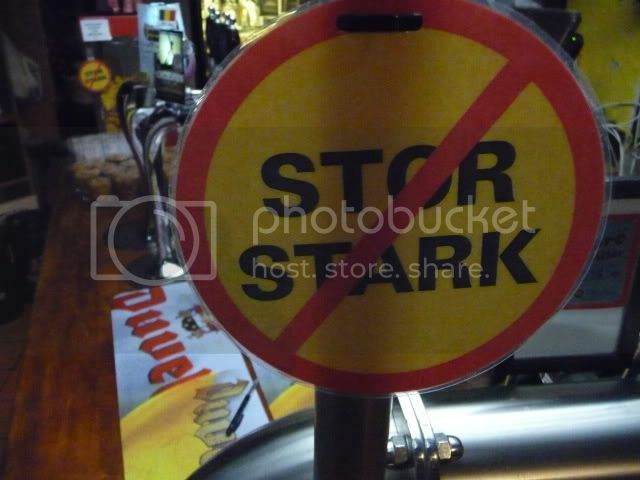 The beers below 4.7 % would be sold in Norwegian supermarkets, so you’ll not find them in the Vinmonopolet stores. And the super strength lagers are hardly to be found here. I suspect the Norwegian tramps either smuggle strong beer from Sweden or stick to vodka. Call me a snob, but I pass on the red rhubarb flavoured cider (82). If you set up a scale of nostalgia for the DDR, I would not be far from the origo. But approximating zero is not equal to zero. The Nikolaiviertel in Berlin Mitte is something the regime should be credited for. This quarter was, as most of the city, reduced to rubble in 1945, and it took quite some time before they got around to restoring it. The restoration did not just set up some big slabs of concrete, this was an attempt to recreate the oldest part of the medieval city for Berlin’s 750th anniversary in 1987. What we find today is a charming collection of restored and replicated houses with lots of outside seating at the riverside cafes in sunny weather. 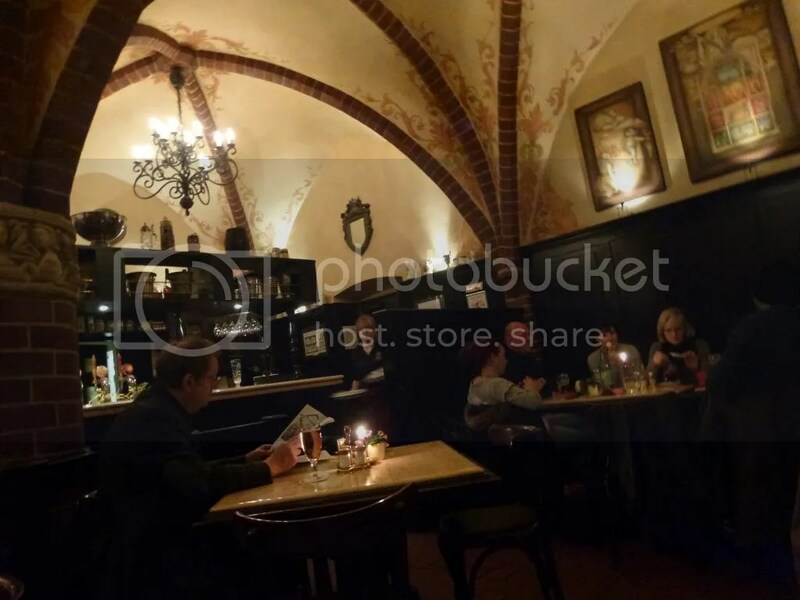 During the winter, you find cozy old-fashioned restaurants and Kneipen, most of them more on the rustic than on the high dining side. 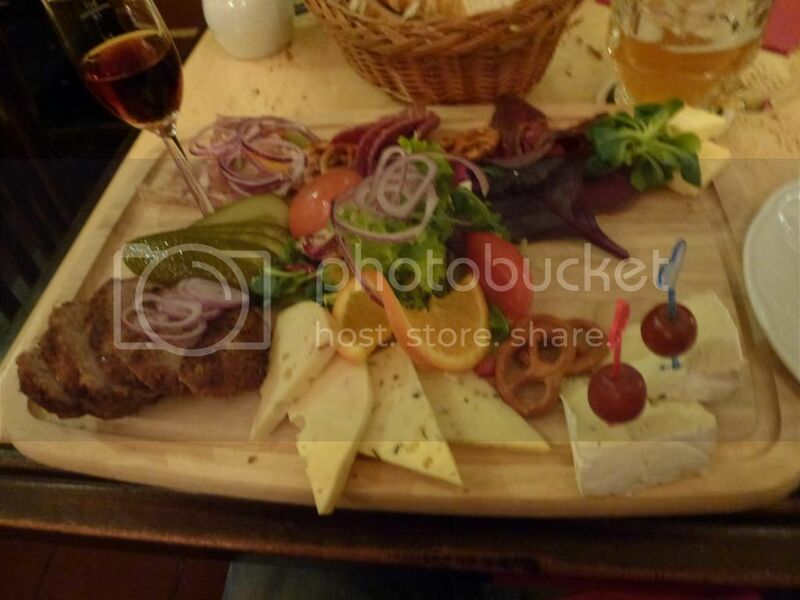 On a cold and dark evening in January, Zur Gerichtslaube offers a range of local and regional dishes. This restaurant is located in was used to be an old courthouse. I have a feeling that the present building is pretty new. Their web site informs us that all in all the Gerichtslaube was reconstructed three times and relocated twice, but it is rather vague about dates after 1482 or so. But the illusion works well, you have the feeling of entering a place with roots going back to the middle ages here. The food leans heavily towards the Sauerkrauft school of cuisine, but there are vegetarian options, too. With just a few days in town, I wanted to try something beyond sausages, and the Grosse Abendplatte, the large evening board seemed to be the thing. Meatballs, smoked venison, cured deer sausage, cheese, pickles … there was even a herb Schnapps included. Very pleasant, but the cheese selection was not particularly inspired. Polite and friendly service, mixed crowd. I have a feeling this is packed with tourists in the summer, so it is probably best to book a table. I certainly recommend a visit. You can have a snack and a beer if you’re not up to a big meal. Expensive? More so than the place off Alexanderplatz where you get a huge pig’s knuckle and a beer for 10 Euros. But then you get quite another experience. An offer they cannot refuse? On border trade again. According to a campaign in the Danish newspapers, there will be 1450 new jobs in Denmark if the taxes on beer and soft drinks are cut by half. They will buy their cans and bottles at home instead of leaving their money at the border shops in Germany. I am not able to find any signs of this in the reports of a new government package of measures to boost growth in Denmark. Because there are other factors, too. If you compare to most countries, the taxes are pretty low today. And the Danes do eat and drink far too much for their own good already. What is good for Carlsberg is not neccecarily good for Danish public health. 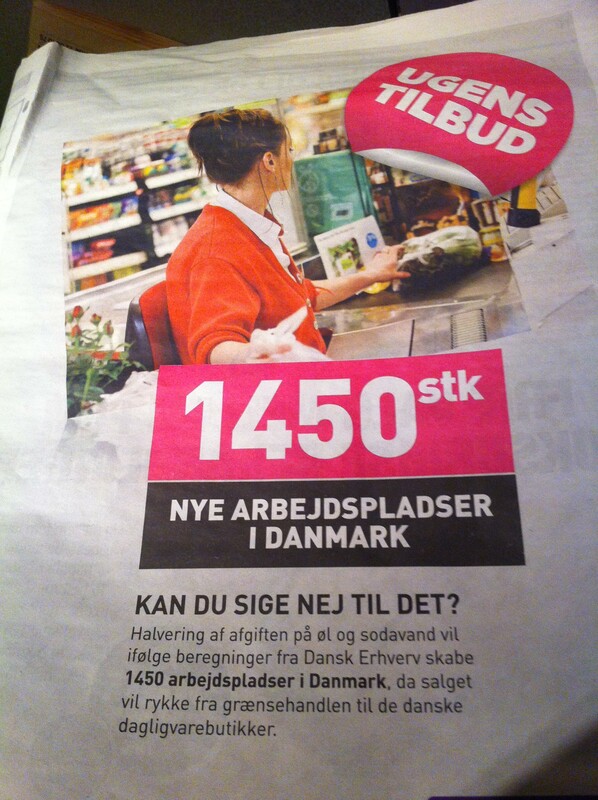 And I wonder if those who paid for the ad considered how many Danish jobs are dependent on the border trade from Sweden and Norway. Probably around 1450. Many European cities can boast of food markets filled with stalls of proud producers. I have not seen them all, but I tend to seek them out, in Florence and Gothenburg, in London and Barcelona. Berlin can boast of a number of them, although some have obviously been destroyed by war, neglect or urban developement. The Eisenbahnhalle in Kreuzberg has long traditions, but it only in the recent few years that this has been revived, focusing on local produce and everything green. 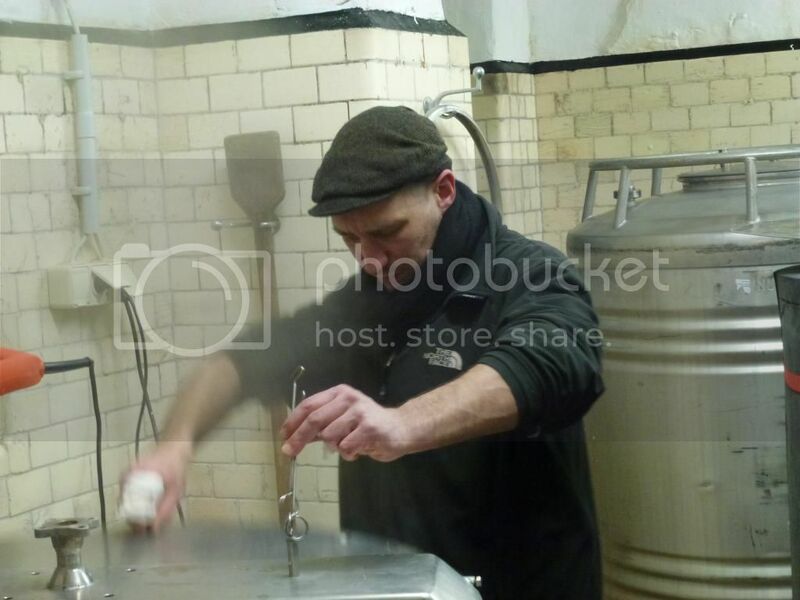 And one of the local producers is a brewer, Johannes Heidenpeter. The market is only open on Fridays and Saturdays but, alas, I was only arriving on a Sunday. Well, there is always Facebook. I asked if there was any way of trying their beers during mys visit, without being too optimistic. I got a message back from Johannes, saying that he would be brewing on Monday and would be happy to have a chat over a beer when he was finished. Would six o’ clock be convenient? The market hall was easy to find, and Johannes invited me down to the basement, where he was finishing his brewing for the day. Johannes started the brewery in September 2012. He has no formal brewing background, but has been a home brewer for quite some time. He brews 300 liter batches, which may be stretched to 450 liters by using the equipment to the maximum. Most of the beers are sold on tap from his tiny bar in a corner of the market hall, though some are hand bottled for people to take home. Business is expanding, meaning he gradually spends more time brewing and less on what he calls his pay job. The beers fit in well with the general concept of the market – local food where the producers have direct contact with the consumers. There is, obviously a challenge in offering inventive beers in a market where the day-to-day choice is between a Dunkel and a Helles. Johannes aims to have, as a standard, a pale ale that is not too extreme, but it is still a departure from the German norm. He is constantly adjusting the recipe, the version I got to taste had Cascade as the dominating hop. It had a fine spectrum of flowers and herbs and a splendid drinkability – just the type of session beer you should find in a place like this. I also tried a poster, soft and smooth, yet with lots more character than the bland big names. The aim is to brew full-time, and there are plans for various events – a small beer festival is also in the making. 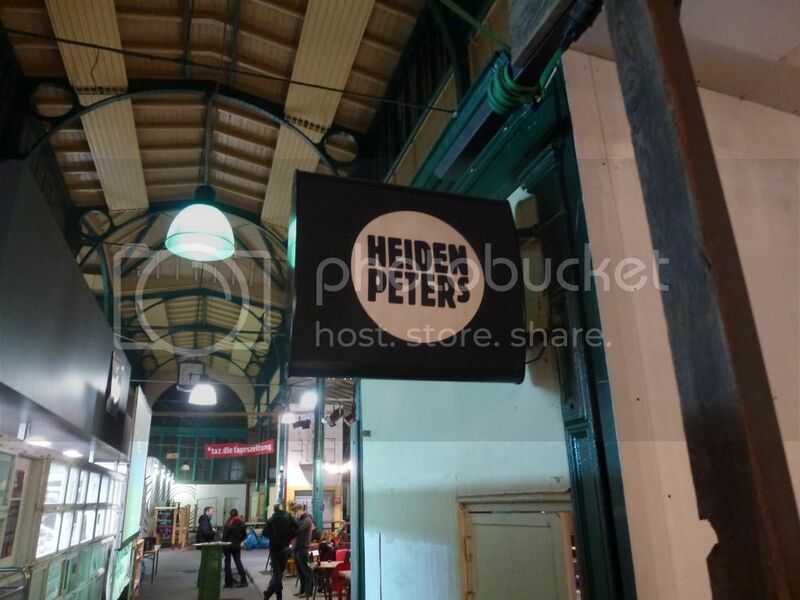 Heidenpeters is a brewery that stands out among the micro breweries of Berlin, daring to think outside the box. It will be interesting to follow in the years to come, I will certainly be back the next time I’m in town. Get in touch if you plan to visit. 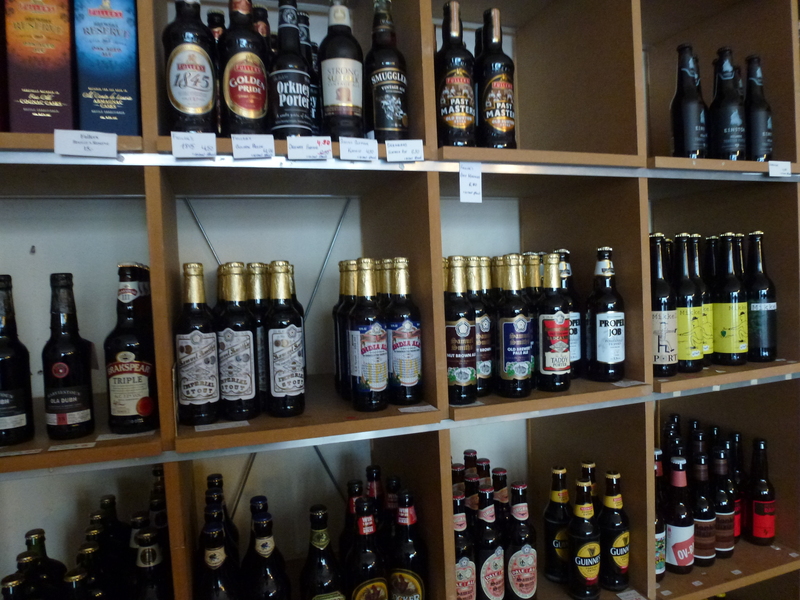 There are a few hand bottled beers available, but they tend to sell out, so ask Johannes to set aside some for you. If I have gotten some of this totally wrong, I apologize. Most of the conversation took place in German, and I must state my admiration for the brewer who opened his doors and carried on patiently while his guest struggled to get his message across with total disregard for grammar and polite use of the language. Nøgne Ø is cutting back on the import side of their business, which means there are new distributors for breweries like Mikkeller. Schouskjelleren brewer John Hudson is moving on after two years, an Italian brewer will take his place. John will be brewing at Nydalen Bryggeri og Spiseri also in Oslo, an offshot from Amundsen Bryggeri og Spiseri. 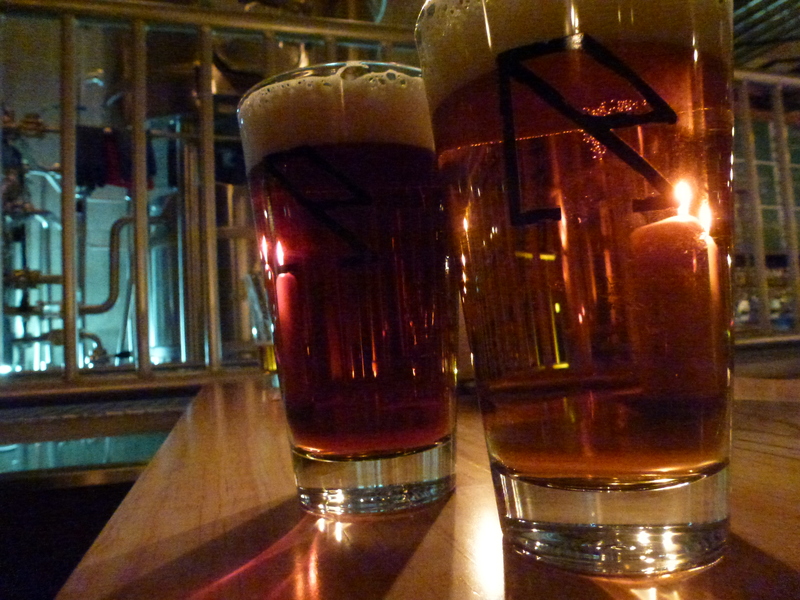 A brewpub, but they will also brew keg beers and plan to bottle beers as well. They aim to open in May. Lots of new beers at Crowbar in Oslo, there seems to be a new of their own brews on every week. Right now there is an interesting series of experimental IPAs. ABC brewing, the gypsy brewery from the west coast of Norway, now has more of a national distribution. Their first beers are on tap at Schouskjelleren now. Interesting to see that most new bars and restaurants in Oslo now boast of their broad range of beers. I’m not too fond of crowded bars late at night. With a bunch of friends it can, of course, be great fun. But when I travel, it’s a quiet glass or two in the afternoon that often pleases me the most. 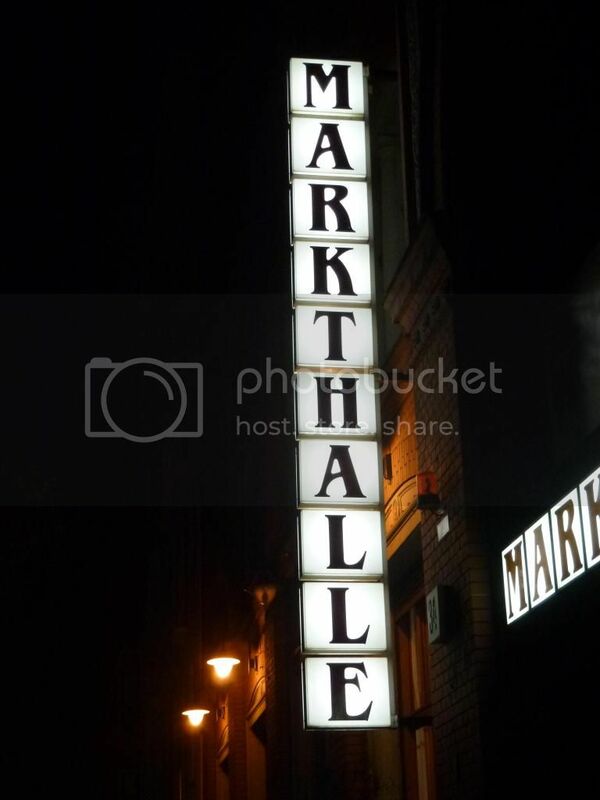 Many pubs and bars stay closed at this time, waiting for the evening trade. That might be sensible, it does not make much sense to pay salaries to idle staff. In Berlin, there are places open all day, some only in the evening. On a chilly February day, I found one that opened at five in the afternoon. 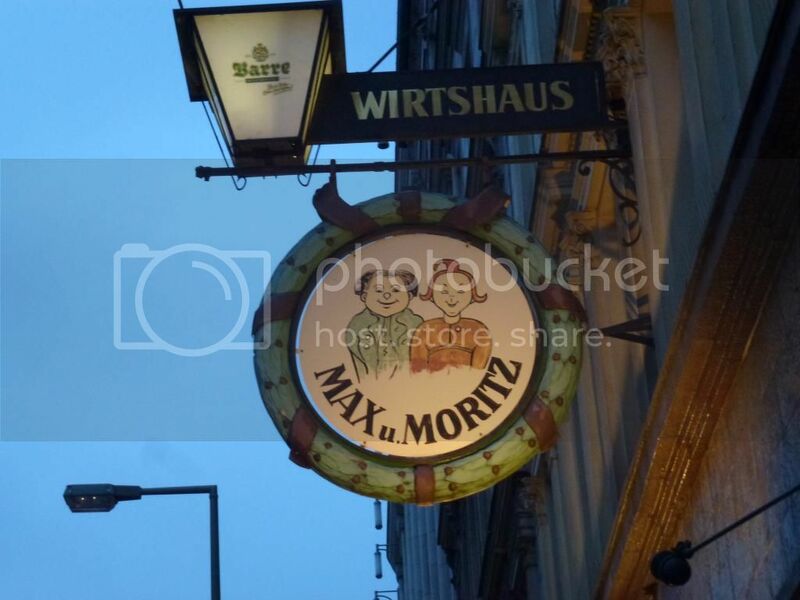 Max und Moritz is a classic Berliner Wirtshaus, dating back to 1902 with lots of the details intact. A bar area as you enter, dining tables at the back. When I look at their website, I see that there is a ballroom in the building, seating 100 diners and available for cultural events. Tango lessons on Sundays, if I remember correctly. Two ladies behind the bar, one of the regulars conversing with them. Polite and friendly service. Traditional cooking, not surprisingly heavy on the pork, but even some salads and other vegetarian options. Too early for supper, but certainly worth considering another day. Two beers stand out in their drinks list, one unfiltered, one clean and crisp pilsener. 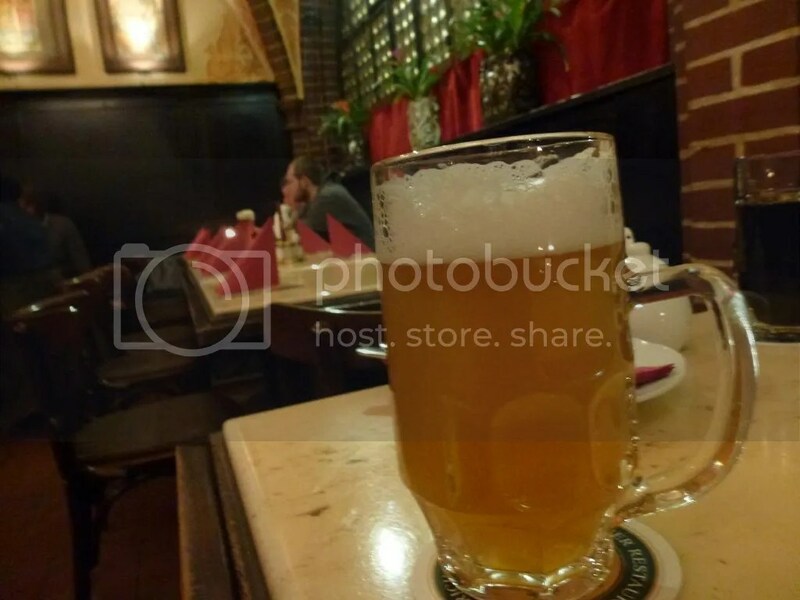 The Zwickl is specially brewed for them, and is called Kreuzberger Molle, which I believe is brewed at the Südstern micro, not far away. Chewy cereals, honey, flowery hops. Pleasant drinking, but not really exciting. 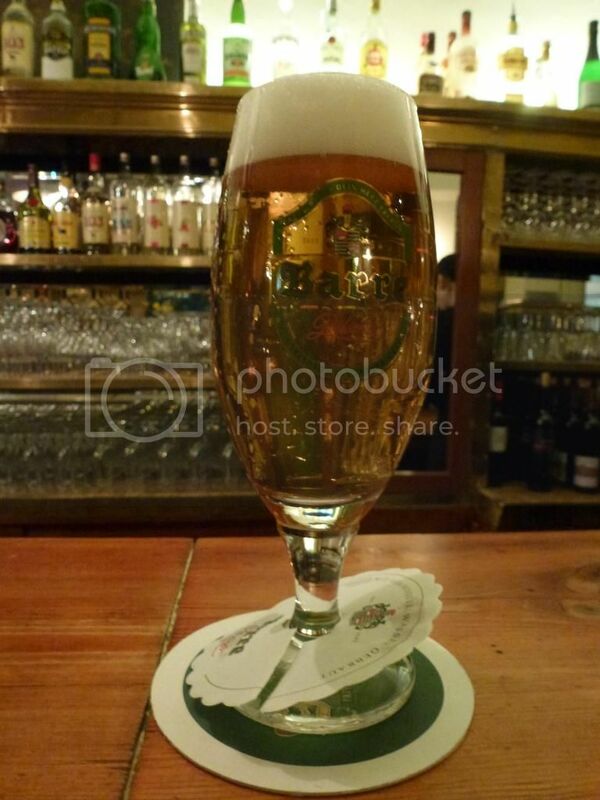 I prefer the Barre Brau, a German pilsener at its best. Clean and crisp. Herbs and grass, dry finish. Unpretentious and refreshing. And, if you need one more for the road, there is a Kneipe next door that boasts of a Duckstein Dunkel on tap. Hm. Located in Kreuzberg, just a few minutes from the Moritzplatz U-bahn stop, so it’s just ten minutes from the Alexanderplatz. And I must mention that I would never have found my way to this one if it wasn’t for the Around Berlin in 80 Beers book. Btw Max and Moritz are two characters from a series of books for children dating back to the mid-nineteenth century.